Are you training your group leaders the right way? Many churches make a mistake when it comes to training their group leaders. Actually, they may make several mistakes. Luckily, though, those mistakes can be corrected. This past weekend friend and author Mike James (in the picture to the right) came to my church to train our group leaders. 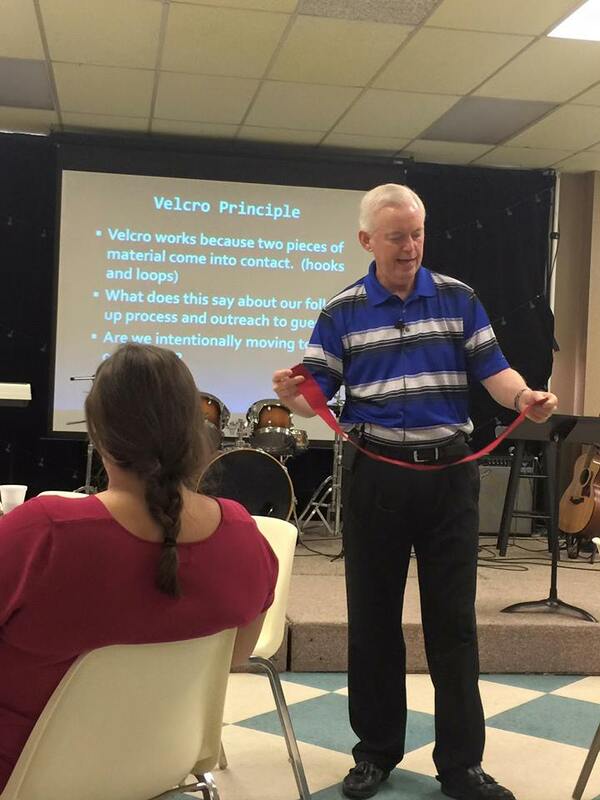 He focused his training on the book he and Dr. Ken Hemphill co-authored, VELCRO Church. I am a group leader in my church, and this time I was on the other side of the training event. I sat at a table with other group leaders and was ministered to by Mike’s encouraging words. Normally I am doing what Mike was doing this past weekend – training group leaders. But this time I was on the receiving end of good group leader training, and it caused me to ponder a few mistakes that many churches make when it comes to training. Hopefully you won’t find yourself and your church in the list of mistakes below. Mistake #1: Training is too infrequent. Some churches provide only one annual training event for their group leaders. Normally this is done around “promotion Sunday” when school-aged kids and teens promote into their new Bible study groups for the school year. A one or two-hour training event isn’t sufficient to sustain momentum and keep attention on things that are critical to establishing a healthy Bible study group system. No one would dare feed a baby, a pet, or themselves once a year – they’d starve! But many churches are unintentionally starving their group leaders by not providing a regular diet of training opportunities. As a friend of mine has said, “If you starve anything long enough, it will die.” Try living by the adage “Once is not enough” when it comes to training. Mistake #2: Training isn’t reinforced. If training isn’t done strategically throughout the year, a once-a-year training event and the financial investment a church has made can be wasted. A good strategy is to have an annual theme, train group leaders in a kick-off event, then follow up that event with quarterly training. Teachers need to be reminded about the importance of the training they received, so carry a theme forward throughout the year. The worst thing you could do would be to invest your church’s finances and resources in your group leaders, then wash your hands of any further responsibility to train and encourage them. Perhaps your annual kick-off event is for all teachers – consider following it up with quarterly training for age group teachers (preschool teachers, kids’ teachers, student ministry teachers, and adult teachers). If you provide training in August, schedule another reinforcing event in October, another one in January, and a fourth one in April/May before summer arrives (I used to schedule an appreciation banquet for group leaders in late spring; I brought in a guest speaker, provided a good meal, thank-you gifts, and encouragement for group leaders to continue in their teaching roles when Promotion Sunday rolled around in late August). Mistake #3: Teachers are not held accountable to attend training. People attend training on their jobs (it’s hard to think of any job that does not require ongoing training for its employees; the church should do no less – we are dealing with eternal matters). I believe that a commitment to teach should first be a commitment to be trained. If a group leader refuses to attend training events, say goodbye, find them another job to do in the church, and replace them with a person who is committed to growing beyond their current abilities. Kingdom work is serious business, and it requires serious actions; don’t shrink back from your responsibility to hold teachers accountable, and if you are a group leader, it’s time to accept your responsibility to be trained so you can more effectively teach and lead your group. It was a joy to be in your church Ken. Keep up the great blog.